We’re on the countdown to New Zealand Babywearing Week (2-11 October 2015) and we are looking forward to celebrating with you. 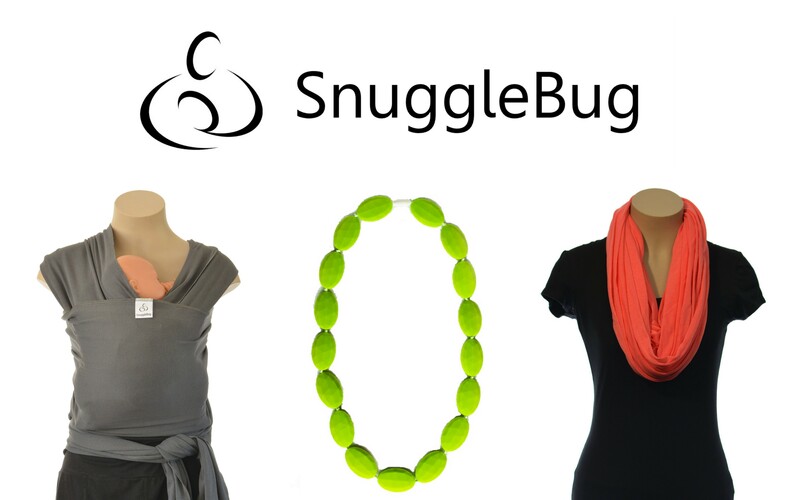 Our next giveaway is a prize pack containing 1x classic Snuggle Bug wrap, 1x Snuggle Bug nursing scarf and 1x Chartreuse Funky Teething necklace, courtesy of New Zealand Babywearing Week sponsor SnuggleBug. Snuggle Bug wraps are affordable 100% cotton New Zealand made baby wraps that allow busy parents to keep their baby close while they continue with everyday activities. Snuggle Bug nursing scarves are a stylish and convenient way to discreetly feed your baby. The unique infinity scarf design folds out to be a lightweight feeding cover for when a bit of extra privacy is needed. When not in use, the scarf can be worn in one of eight fashion ties or simply folded up and put into your bag. Made from lightweight and breathable fabric that provides baby with good airflow during feeding so that they don’t overheat. Snuggle Bug Teething Jewellery is designed to be both fashionable and functional. It looks great and provides a safe option for mums with babies that love to chew, pull and play with their jewellery. Please note that this giveaway is open to New Zealand residents only. Like the SnuggleBug facebook page and leave a comment to say hi and how you found their page. Leave a comment under this post to let us know why you would like to win a this prize pack. Change your facebook profile pic to the New Zealand Babywearing Week logo so that we see it when you comment on the facebook page to enter. The logo may be taken from the New Zealand Babywearing Week facebook page profile picture. Good luck to all who enter! A winner will be drawn after 8pm on Friday 2nd October 2015. New Zealand Babywearing Week – the countdown is on . . . This entry was posted in Giveaways, Stretchy Wraps and tagged international babywearing week, New Zealand Babywearing Week, NZ Babywearing Week, SnuggleBug, stretchy wrap. Bookmark the permalink. To have the opportunity to wrap my daughter would be amazing. I would love to prove to my friends & family that wrapping is a good idea! This looks awesome. First baby due on February, halfway today! Would love to win this for my friend Kendra she is due with number 2 in March,and lives rurally so would be perfect to have baby wrapped and still carry on with farm life! After #2 I gave away my wraps as I was all done… until suprise #3 showed up! I would like the opportunity to wrap baby also, it’s due Dec so not long now! Snuggle bugs are the best! I had one with number 2 an it was a life saver I then gifted it to another mumma but am now due with number 3 in March 🙂 would be so handy to have ! I would love to win this snugglebug wraps are essential for new squishy cuddles! A SnuggleBug to snuggle my bug.